MP3 Toolkit is a powerful Mac OS X app includes MP3 converter, tag editor, MP3 cutter and MP3 merger for users who want to handle MP3 files easier. You can use MP3 Toolkit to convert audio for mobile devices, make ringtones, fix tag information, merge audio pieces to a complete MP3 file. 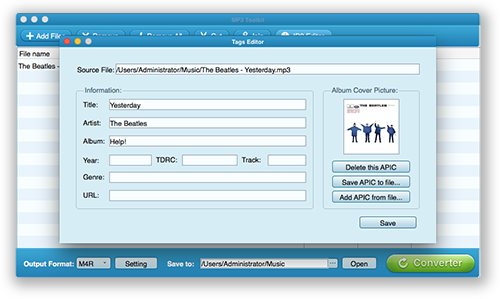 With this program you will be able to edit MP3 tag information. Also, the editor will allow you to edit album photos. Got some cool audio parts to combine MP3 Merger can merge & combine your several FLAC, MP3, OGG and WAV audio files to a complete single audio file. 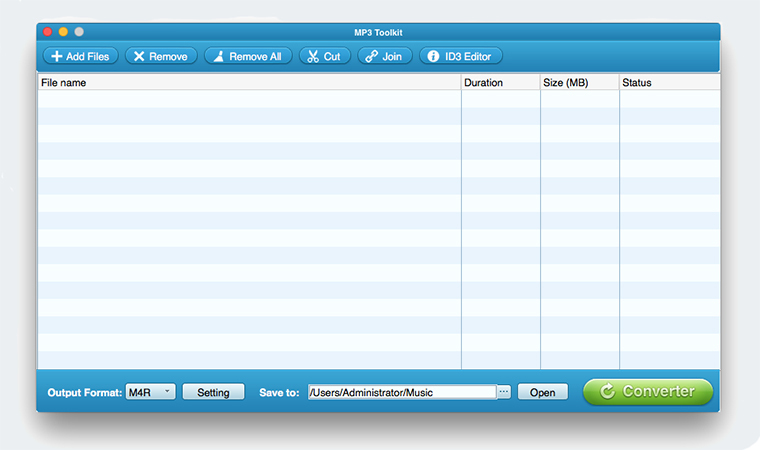 Using MP3 Cutter to make ringtones is a good choice. It can cut a specific time audio piece from a song.